With our first snow of the season upon us we would like to remind everyone to please you extra caution when driving tonight and to drive only if absolutely necessary. A Winter Storm Warning for snow means severe winter weather conditions will make travel very hazardous or impossible. If you must travel, keep an extra flashlight, food and water in your vehicle in case of an emergency. Check local Department of Transportation information services for the latest road conditions. .WINTER STORM WARNING IN EFFECT UNTIL 10 PM EST THIS EVENING... * WHAT...Heavy wet snow expected. 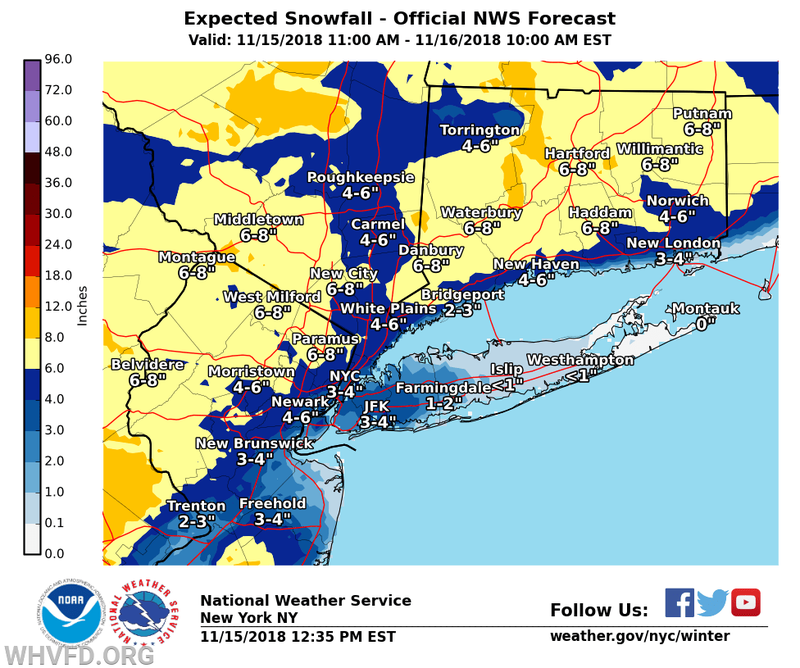 Total snow accumulations of 4 to 6 inches expected. Snowfall rates of 1 to 2 inches per hour possible. Winds gusting as high as 45 mph. * WHERE...Southern Westchester County. * WHEN...Until 10 PM EST this evening. * ADDITIONAL DETAILS...Plan on slippery road conditions. The hazardous conditions will impact the evening commute. Gusty winds could bring down tree branches.